The Crystal Lake Modern Quilt Guild is doing a BOM quilt and some of the members are helping out by doing the demo on each one. Our demo was the “X and +” block. The demos are done in all the same colors, which are our CLMQG logo colors, but each member can make their own version. Should be interesting to see what everyone comes up with since we all have so many different styles. 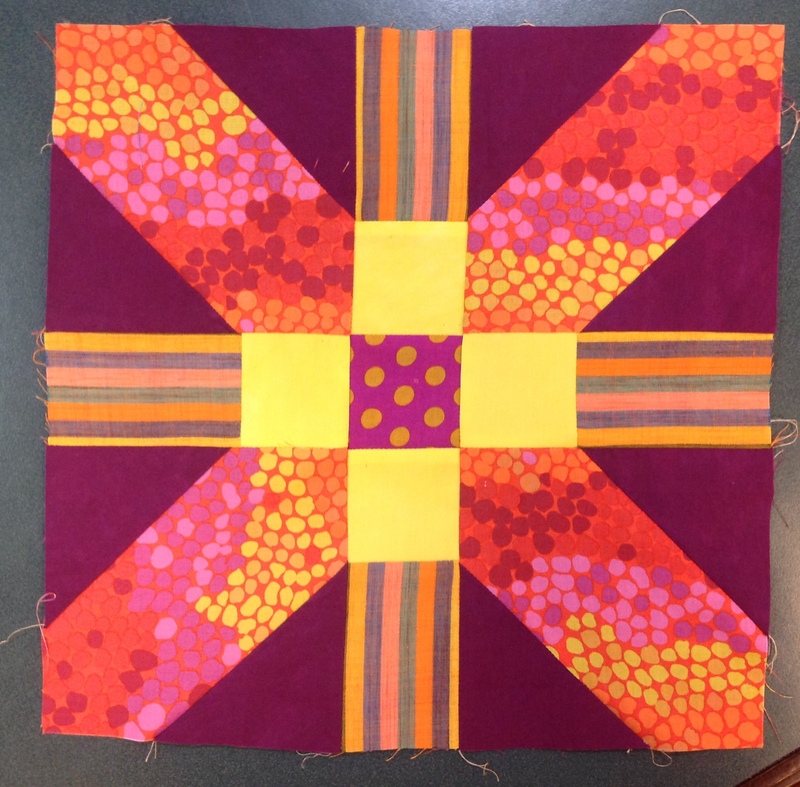 The demo quilt blocks will be put together and raffled off after we’re all finished. 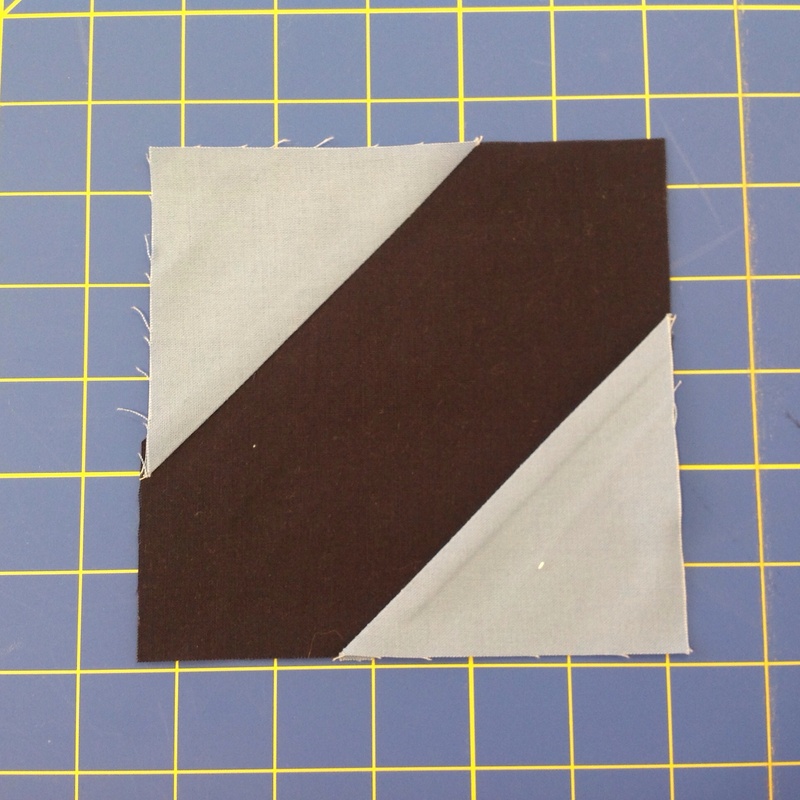 Our inspiration for this block was a tutorial provided by Amy at BadSkirt.com. If you live in the Northwestern suburbs of Chicago and haven’t visited us, please do! We have a great time. There is lots to learn from each other. Many workshops are offered throughout the year and it’s a great time to catch up on all those UFO’s you have laying around. We meet in the basement of the Crystal Lake Home State Bank Mortgage Center on Route 14 typically the 2nd Sunday of every month. We look forward to seeing you! So what do you say let’s get started on this block? 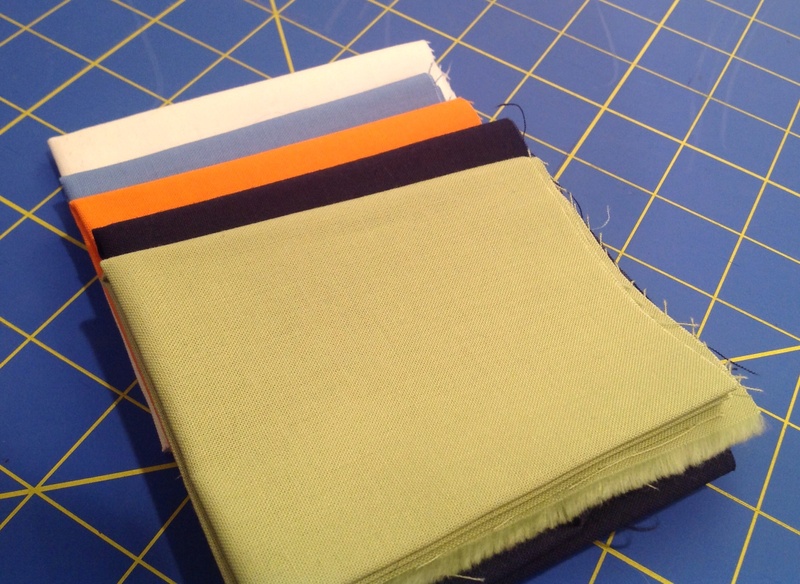 Gather up those fabrics. We used Kona cottons for the demo but you can make this scrappy too. What a great way to use up some of that fabric! 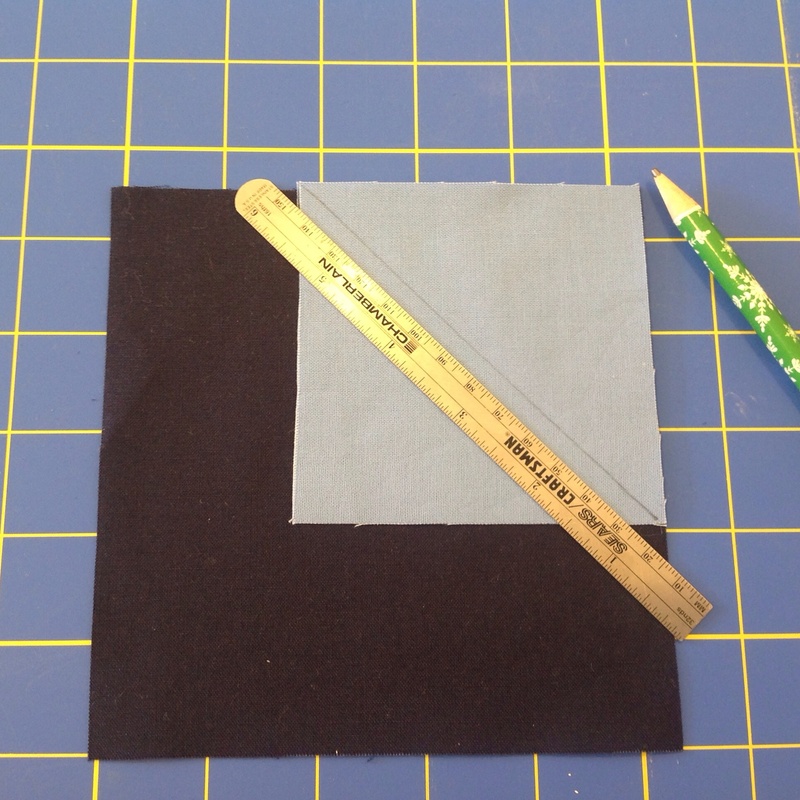 On the back of the light blue squares, mark with a pencil from corner to corner. 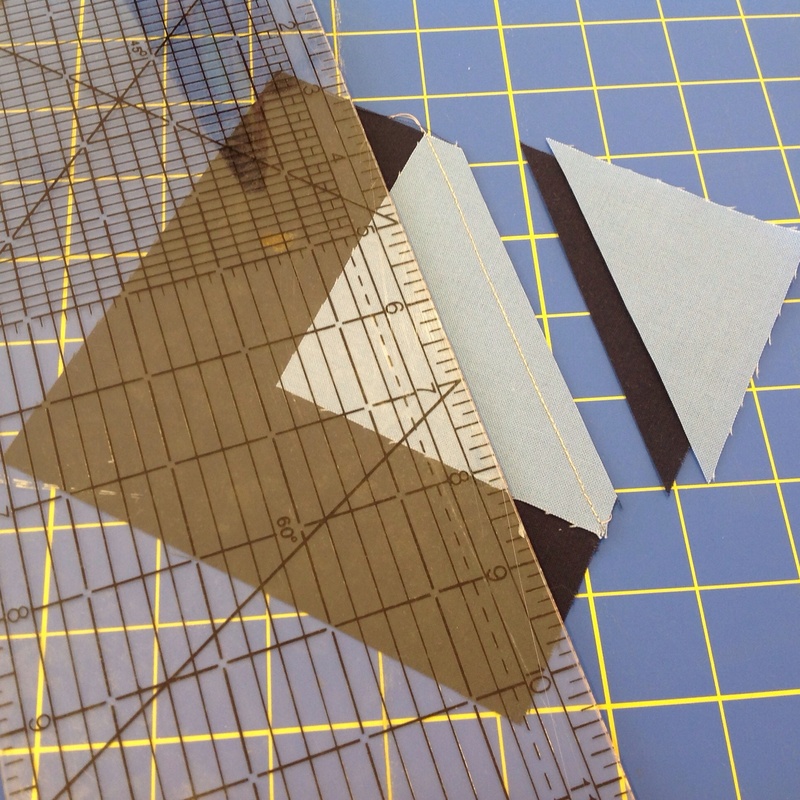 Sew directly on the line and using a rotary cutter, trim the seam allowance to 1/4″. Repeat for each block. Press and repeat for the opposite corner. 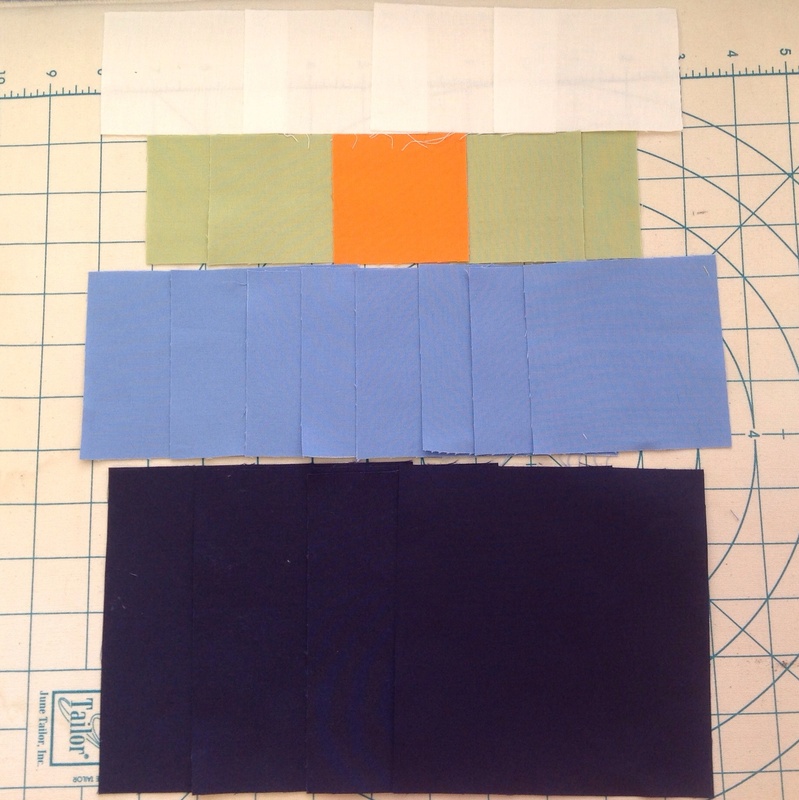 To make the + in the center of the X, sew the blocks in the order according to the picture. Press the seams to the left. 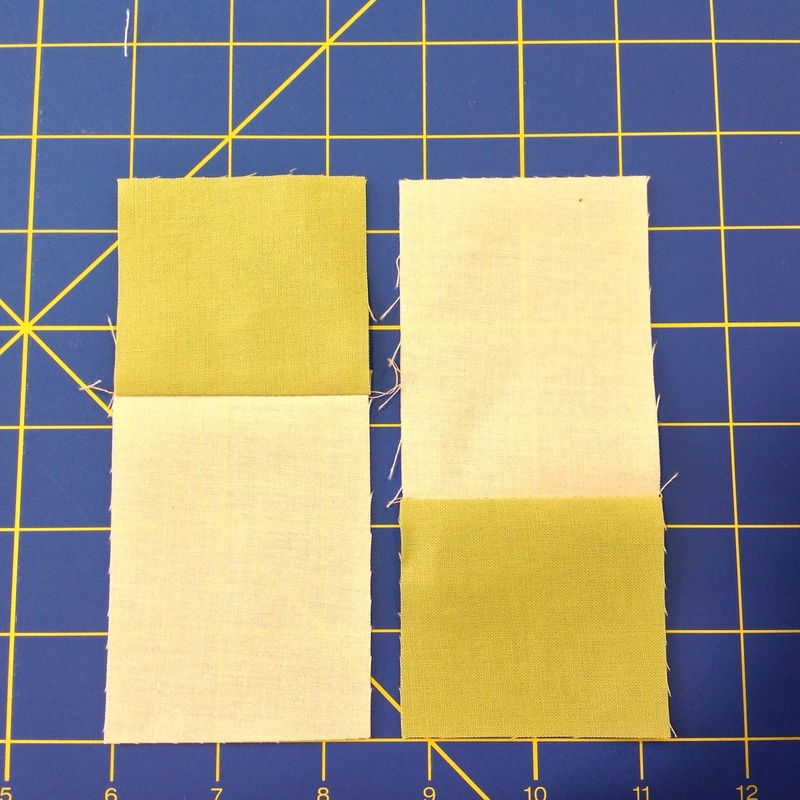 Sew the remaining green squares to the white rectangles. 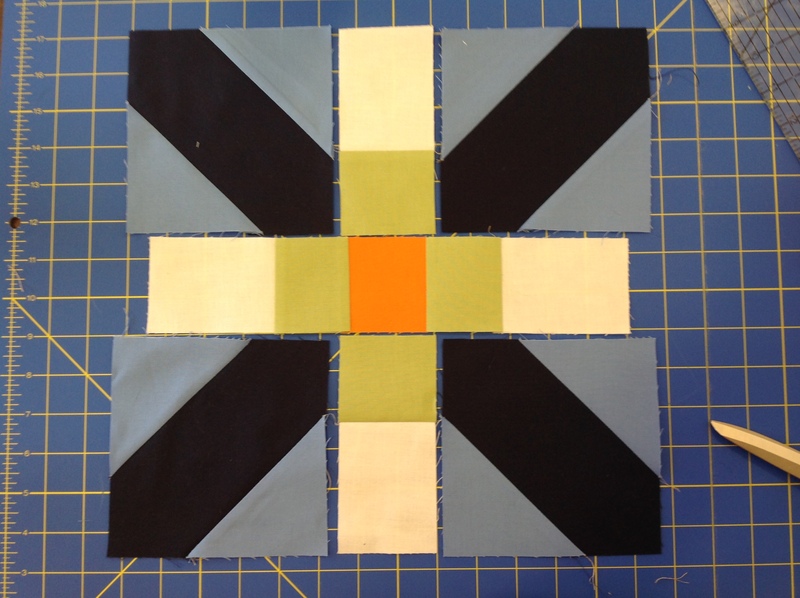 Lay out your block according to picture and begin by sewing the X blocks to either side of the green/white units. Press to the right. 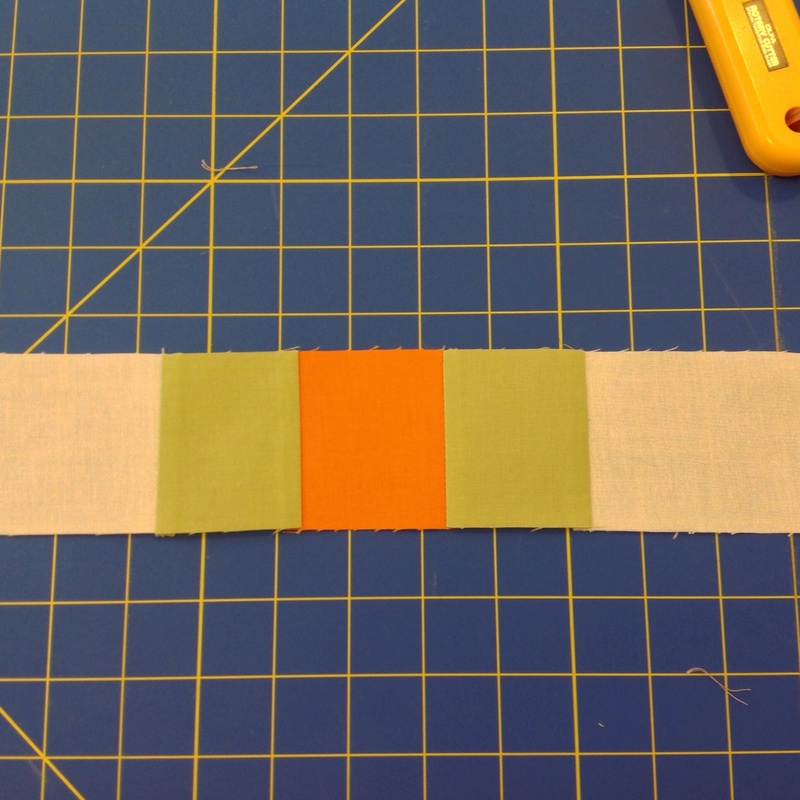 Finish by sewing the rows to the top and bottom of the middle white/green/orange unit. 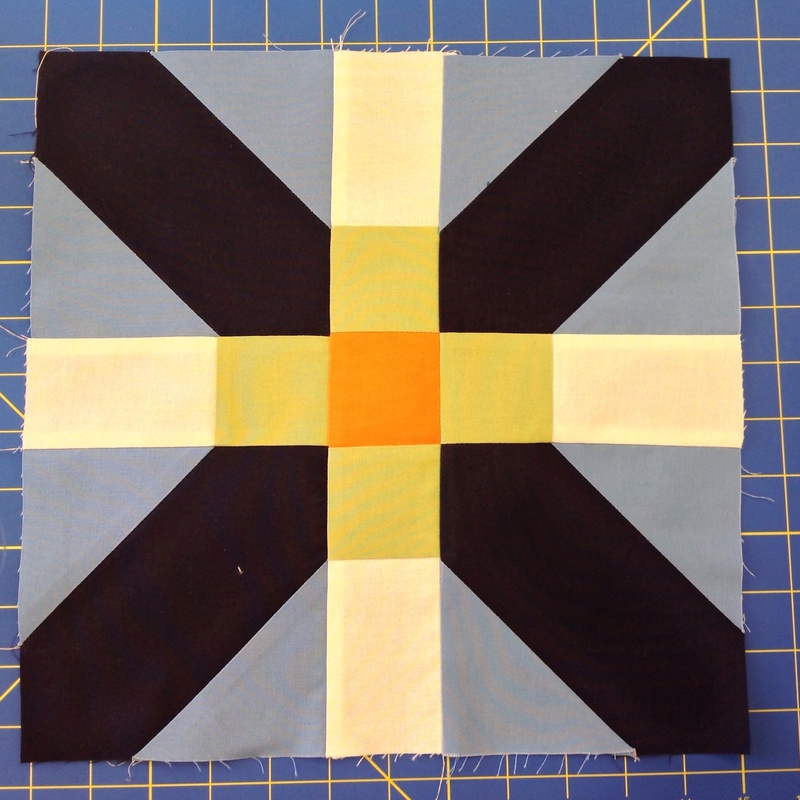 And here is the finished X and + quilt block for the Guild! Easy,right? This is the one we are adding to our BOM quilt. Paige picked out a variety of hand dyes, modern plaids, and Kaffe fabrics. It’s going to be wild, crazy modern and I am excited to put this together! Check back often to see our other blocks from the quilt.